Sometimes I like non-beauty things and I want to write about those non-beauty things. One of those things is candles and I am particularly obsessed with this beauty picture right here. 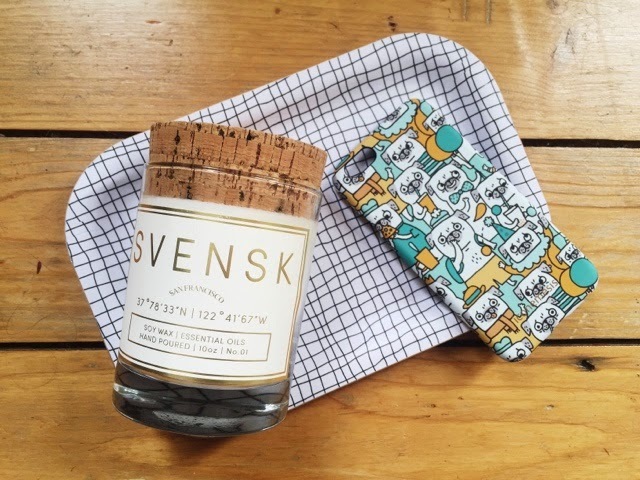 I discovered Svensk Co through Instagram (they essentially have the perfect Instagram feed: candles, nature, food, you name it... it's incredibly aesthetically pleasing) and thought the packaging just looked so beautiful. The company is pretty new and it's based in San Francisco, obviously with Swedish (<3) inspiration behind it but you can read all about that on their website. The candles are made from organic soy wax so the burn is clean and it comes with a 100% natural cork stopper which looks really nice. I believe the one I have is the Skogspromenad one but there isn't the smell name on the packaging so I could be wrong, but I'm pretty sure I right. I don't know. I hope so. Either way, the candle I have smells amazing and the packaging is so pretty... I need more of them in my life. I believe I read they will be introducing soaps soon which I will need to get my hands on because I'm all about pretty, simple, nice-smelling thangz. Another Swedishy thing is this tray which I bought when I was in Stockholm recently. I think I got it from Design Torget?! I have a little cube indent in my wall which acts as a bedside table and I have it in there with my bits and bobs on it and I just think it looks pretty and neat. The final thing is this Pug Iphone Case* from Iconemesis. I chose this case because I think it's kind of ridiculous but in the best way possible and I love dogs. I am seriously going through a phase of really wanting a dog but there is just no way I could have a dog at this age... so I'll just have them on my phonecase for now. This phone case has a rubbery texture which means it feels really soft, you don't get annoying finger marks on it and it's a great texture to grip onto. I just think it looks adorable and I am not into cutesie things at all but I think this is fun without being too girly. That pug case is adorable! The pug iPhone case is too, too cute!